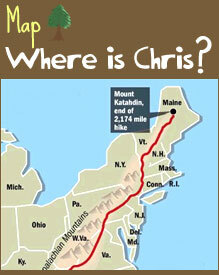 Based on what you know now, do you think Chris will finish the AT? How many miles have you run/hiked/walked in the past week? How many miles have you hiked on the Appalachian Trail? Have you heard of World Vision before? Do you already sponsor a child on a monthly basis through an organization like World Vision/Compassion/Save the Children?